A pergola or deck from AMG Quality Constructions is a great way to utilise space, improve the look of your home, and add immediate value to your property. When thinking about adding a carport, pergola, verandah or Decking Lilydale residents know to call the team at AMG. We always strive to achieve the highest quality solution for every individual project. We’re passionate about transforming outdoor living areas, undertaking every project with the same professionalism and enthusiasm as if it were our own home. We don’t just want you to be satisfied with your project – we want you to be ecstatic! No matter the size and shape of your home, with the right decking plans and a lot of hard work, it can accommodate an outdoor deck. Creating a seamless transition between your indoors and outdoors with decking where you can relax and entertain all year round, while at the same time enhance and add value to your property. Our timber or engineered decks will turn any space into an entertaining area for you to enjoy for years to come while increasing the value of your home at the same time. 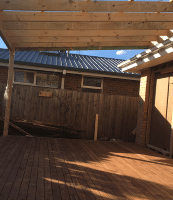 Every decking Lilydale project is custom designed to suit your specific land & budget. After all, one size doesn’t fit all! A pergola is a fantastic way to not only improve the visual appeal of your home but to also add some much-needed shade while providing a great place to entertain. Pergolas can be built in a variety of styles from a standard pitched roof to match your house or a flat roof for a more straightforward appearance. Here at AMG, we make building your new pergola an easy, hassle-free process by providing you with a complete service that includes the measure and quote, product selection, design and installation all carried out personally by our qualified carpenter. We can deliver a structure that looks great, is effective and will make you the envy of the neighbourhood. Our vision here at AMG Quality Constructions is to deliver not only the highest quality product but also to provide a service that is of the highest standard. You can rely on the team at AMG to give you the best quality products and workmanship for your outdoor projects, whether it be a new pergola, a carport, verandah or decking Lilydale wide. We’ll work with you from the initial concept phase and right throughout the design and construction of your project to make your vision a reality. To enquire about decking and Pergolas Lilydale residents can call the AMG team on 0432 170 146.
for us to contact you!